Do you think this guy & his son will ever pop up again??? and dies of a staph infection! If they are with Andrea, better chance he dies of syphillis. Interesting. I thought that the Gov was mad at Merle because he told him that he had killed Michone, and hadn't. I don't think Merle is in on this plan if that's what it is. It was a good, solid episode. Is it February yet? As far as Merle joining Rick and the group, I don't really see that happening. Keep in mind that he tortured Glenn and threw a zombie in the room with him for a cage match. He was also involved with Maggie's detention. But, who knows..it's TV. Man, they killed off 2-dawg too. True, Merle certainly hasn't made any friends in the Rick group up to this point. Even before Woodbury, Merle didn't exactly make nice with the group way back in Atlanta. They did have to handcuff him to the roof in the end. However, he is still Daryl's brother and it is TV after all. I believe in the comic they do pop up again. From what I've read about the comics, the TV show doesn't follow them quite exactly. 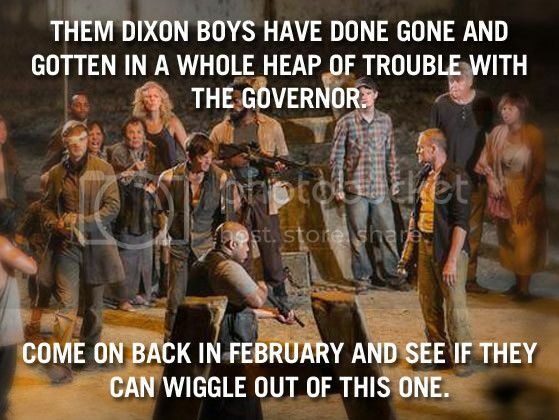 However, it does use some of the major plot points like the prison, the farm, Woodbury, the Governor, etc, etc, etc. So, I would expect them to pop up again at some point. And first mention of comic spoilers. True, in the comic there is no Darryl or Merle....and Tyreese is with the group when they discover the prison. Andrea is a badass and there is no baby. LOL Hilarious Powers... where do you find these? OMG Michael... you just ensured that I do nothing productive for the next 30 minutes while I look at these... LoL I love the first one about "the progression of Rick"
My 16 year old son pointed out this the other night. He said being a black guy is the kiss of death in that group. Good luck Tyreese! They are both dead aren't they? or am I mistaken? The show from what I've read of the comics really only follows the comics loosely. Even though I've read through the Walking Dead comic wiki I know I still find the show exciting and there's no guarantee that characters I read about in the comic will be in the show so I don't know if I would call anything a spoiler necessarily if it came from the comic. I know I told my wife "the boat sinks at the end" before she went and saw Titanic but she really enjoyed the movie anyway. I really hope so and didn't like when The Sopranos dropped major plot points. Season one and a chunk of season two we're great. Something is missing this season. Losing Lori was the most powerful moment of the season thus far and like others have said good riddance. Like a freaking soap opera all these people could avoid a lot of pain by just talking to one another more. It will be a disappointment if Andrea talks the situation down. haha, but overall she is a huge turnoff for me. But not near the weiner-wilter Lori was. Feb 10 is right around the corner!